I was interviewed by the very capable Chris Kenneally in the Beyond the Book podcast and by the energetic Len Edgerly at The Kindle Chronicles (available also on iTunes, as TKC 340). You can preview the intro at Google Books. There’s a slide deck free to download on SlideShare. You can read it online, for free, here. You can get the quick lowdown from a couple of articles I wrote for Publishing Perspectives and for Porter Anderson’s FutureBook column. 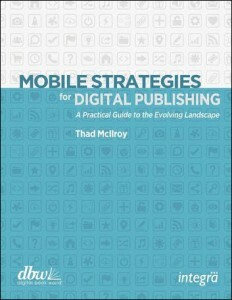 My co-publisher, Digital Book World, has been very thorough in its coverage. You can listen for free to my 1-hour Digital Book Word webcast, recorded on February 17. And we’ve had generous support from our sponsor, Integra.